FBI and Secret Service agents partnered with state weights and measures officials at the 2016 NCWM Interim Meeting this month in a national training effort on identifying and investigating credit card skimmers at gas stations. In some cases, investigations have already led to multiple indictments. Skimmers can be here today and gone tomorrow as the criminals move them from one station to another. FBI and Secret Service agents partnered with state officials in a national training effort on identifying and investigating credit card skimmers at gas stations. State and local weights and measures officials from across the country attended this special training event in conjunction with the 2016 Interim Meeting of the National Conference on Weights and Measures earlier this month in San Diego, CA. Credit card skimmers are installed in gas pumps without the retailer’s knowledge and are used to steal consumers’ credit and debit card information when they pay at the pump. 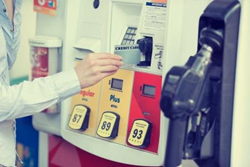 In a recent polling of states, NCWM learned that skimmers have been found in gas pumps in all regions of the country. In some states, the weights and measures officials have teamed up with law enforcement agencies to find skimmers and investigate these crimes. This is because weights and measures inspectors already have access to fuel dispensers within their jurisdictions. Dr. Matthew Curran, Director of Florida Weights and Measures and Craig VanBuren, Director of Consumer Protection in Michigan were part of the panel providing this training. Both have cooperated with federal agents to find and prosecute the criminals. "Skimmers can be here today and gone tomorrow as the criminals move them from one station to another," said VanBuren. "By becoming actively involved and cooperating with federal agencies and the banking and finance industry, our investigations have helped lead to multiple indictments." Curran, who's investigations included their own Agricultural Law Enforcement Division, added that 165 skimmers have been found in Florida alone since his staff began looking for them this past year. NCWM Chairman Jerry Buendel of Washington State pointed out that weights and measures inspectors routinely open the cabinets of retail fuel dispensers as part of their normal inspections. “This special training at NCWM helps prepare them as logical partners with federal agencies to combat increasing credit card fraud by showing them specifically what to look for,” said Buendel. Attendees were presented with examples of credit card skimmers that have been discovered in gas pumps. However, the panelists warned that these same skimmers can be installed in any point-of-sale device that has a card reader. Retail fuel dispensers happen to provide easy access for quick and undetected installation.